Nephrology deals with medical issues of your kidneys. As a board-certified nephrologist, Svetlana Pyatigorskaya, MD, most often offers non-surgical procedures to treat your kidney ailments. Since she’s also an internal medicine specialist, she acts as a primary care physician at the Century Dental and Medical Center. As with all the doctors at the Century Medical Dental Center, Dr. Pyatigorskaya performs a variety of procedures, as needed. She diagnoses your issue and can rely on multiple other specialties under the same roof. Some of her most common kidney procedures include dialysis and renal replacement therapy. She also treats acute kidney failure, which is life-threatening. In severe cases, she may perform a kidney transplant. And no matter what treatment you undergo, she administers appropriate medications to support your body while your kidney recovers. 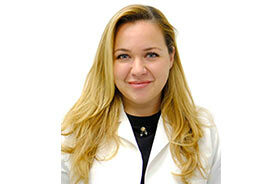 Dr. Pyatigorskaya received her undergraduate degree from Hunter College in New York City. Then she obtained her Doctor of Medicine (MD) degree from the Ross University School of Medicine. She completed her residency in internal medicine at the Maimonides Medical Center. Later, she passed through a nephrology fellowship at the Nassau University Medical Center. One of seven doctors at Nassau University with a specialty in nephrology, Dr. Pyatigorskaya has been affiliated with a number of hospitals in the past. She’s been practicing since 2009. She’s fluent in both English and Russian. Schedule your appointment with Dr. Pyatigorskaya today.